It was some 50 years ago when Mike bought his first guitar and taught himself to play, to accompany his singing. Ever since he has gathered up a plethora of songs and stories from many sources and musical genres, from folk to country, traditional to popular, nursery rhymes to old standards, and has written quite a few of his own along the way. He currently divides his musical talents between a weekly U3A Song Workshop and writing & performing songs for theatrical productions, in and around Cambridge. There is always a demand for some new musical enterprise! Mike’s latest theatre project was to write the songs for “War of the Worlds”. 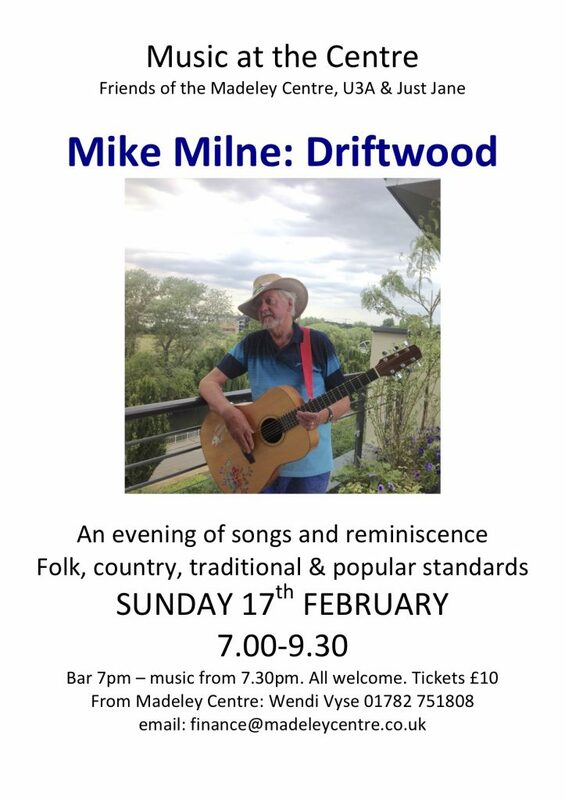 This evening’s performance will be a reflection of his musical journey, with songs collected as ‘driftwood’ along the way – some borrowed and some blue; some old and some new – but don’t expect to just sit back and listen, he loves to hear an audience singing and intends to get you joining in from time to time.